Oh the 80s, how I love thee! The above image of Dazzler, Rogue, Psylocke and Storm by John Allison certainly celebrates an awesome era in X-Men history, as well as bringing attention to their simple yet elegant costume design. Everyone had their signature colors as well. This is the version of Psylocke that I prefer. Check out this solo Rogue drawing, also by John Allison. I just received my copy of the The Art of Jaime Hernandez : The Secrets of Life and Death and let’s just say that this is my new favorite tome. It’s simply amazing! Chock full of illustrations, commentary and comics! The introduction is written by Alison Bechdel of Fun Home fame! This is a must have for any fan of sequential art! Above, the Black Widow paints on her costume! I knew it! To get that sleek catsuit look, one must use the liquid latex! Lots of folks know that Cyclops isn’t exactly one of my favorite characters. He’s not someone I would want to know in real life as his personality is more about being stoic, tactical and taciturn. However, those traits are exactly why I love him in the X-Men. He makes Wolverine and Storm more interesting by comparison. In a team book, his perspective creates complexity and his interaction with other teammates makes for good stories. It was really cool to find the above image by Alan Davis in which Cyclops argues for his existence. At the time this was drawn by Davis, Marvel editorial was about to kill of Cyke and merge him with big bad Apocalypse. Davis was not a fan of this idea and drew this artwork to argue his point. I find it to be a definitive understanding of the character and I agree with everything it says. To me, it’s not about whether Cyclops or Storm is the better leader. It’s about what kind of leader would I rather follow if I were an X-Man. I prefer Storm because I would rather have an empathic ally than a stern taskmaster. However, Cyclops represents the patriarch, and like Wolverine, we must learn from and rebel against his authority if we are to become our own leader. Cyclops serves a very important function in the X-Men. He represents the life lessons of The Emperor tarot card and I wouldn’t want it any other way. Praise the Bright Lady! SF Weekly named me Best X-Men Tarot Card Reader in their Best of San Francisco 2010 Awards! I found out Wednesday morning on Twitter, thanks to my eagle-eyed friends who closely follow San Francisco trends! This morning I was excited to find out that Rich Johnston wrote an article about my tarot readings on Bleeding Cool and Comic Book Resources listed the SF Weekly article in a Comics A.M. post on Robot 6! Thank you SF Weekly for such a clever and accurate write up! I especially like that they call the experience “suspiciously sacred.” Many clients are surprised that a reading with comic book characters can contain depth and discernment and I think this quote accurately describes the experience. Myths are sacred and modern pop culture myths are readily accessible for everyone. What comic myth narrative will speak to your path? Contact me at HeroicTarot (at) gmail (dot) com or call 415.932.6615 to make an appointment and find out! I am available on Fridays, by appointment, at Swankety Swank (289 Divisadero btw Haight & Page). Update: Digital Spy has a ‘lil post up as well! Thank you for joining me once again, gentle reader. This week’s White Queen Wednesday spotlights the artwork of Art Adams, a much-loved mainstay here on STORM’s blog who has been featured on more Storm Sundays than any other artist I can think of. Art Adams is not an artist normally associated with Emma Frost, and with good reason since this is the only published artwork of his which features Emma that I am aware of. In fact I’ve never even seen any Emma Frost commissions by Art Adams, not to say that none exist but I simply haven’t seen any of them and extensive internet searches turn up nothing at all. 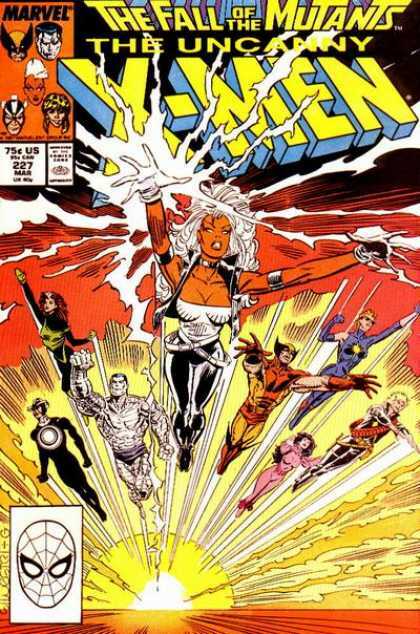 I share STORM’s deep love for the artwork of Art Adams, particularly his X-Men art from the mid to late 80s. Going back and reading those comics now is like wrapping myself up in a big warm blanket made of fuzzy nostalgia. There’s a reason he’s so popular and is consistently named as an influence by many of the most celebrated artists in the field. His expressive faces and animated figures are just a delight to behold. Now let’s turn our attention to his depiction of the White Queen, shall we? This cover is a stunning and memorable portrait of the evil White Queen. With her face almost entirely obscured by shadow but for a hauntingly wicked grin, a triumphant Emma holds the New Mutants in her thrall. She always coveted the team and wished to add their number to her own Hellions. She even temporarily succeeded in recruiting the New Mutants on a couple of occasions, this time in particular when they were mentally traumatized after having been killed and resurrected by the blithely omnipotent Beyonder during the Secret Wars II crossover. It may be a few more weeks before we get the final chapter of Astonishing X-Men as penned by Warren Ellis and drawn by Phil Jimenez. However, last week saw the release of a new Astonishing X-Men Xenogenesis title written by Warren Ellis and Kaare Andrews! I have been so excited about this title and after reading it, I have to say this book delivered the goods! I was transfixed from the moment I saw the above image of the team. The use of black in the costumes is a classic look. It reminds me of Havok’s original costume, which had the habit of making his surroundings pop! 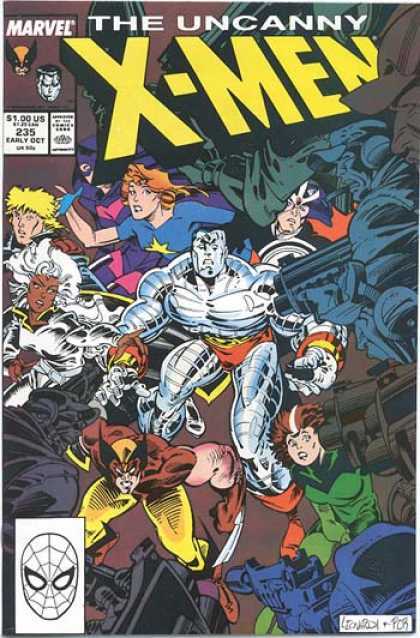 Storm has got her 80’s groove back (scrunchy boots, double belts and mohawk), Wolvie is looking like truck stop trash with an art school twist (any time you wear black you give off an art opening vibe), Cyke’s wearing his ridiculous headgear (I like him best when his hair isn’t covered in his swim cap) but looks great in his black muscle shirt, Armor is actually dressed like the teenagers I see in the city, Emma has finally ditched that ridiculous sheet she wears as a cape, got herself a weave (I’m hoping she and Storm went shopping together), and opted for clunky earrings and chunky shoes, while Beast looks simply primitive (not so sure about those things on his shoulders though). I find these designs refreshing and am glad Marvel gave Kaare Andrews the freedom to visually redefine these characters. I’d love to see what he would do with the rest of the X-Men! The issue begins with the X-Men having breakfast and there’s a lot of dialogue to set up the story. I love that Storm is just chillin’ in her towels. Too funny. Logan looks hungover and you couldn’t tell Emma’s daytime outfit from her nighttime outfit anyway, so who knows if she slept in that. Hisako is drawn too young here, methinks. Scott is presented front and center as befits his status and ego. Immediately, the reader is clued into a little bit of each character’s personality. This attention to character is why I think Astonishing X-Men: Xenogenesis is the best written X-title on the stands today. Ellis doesn’t let continuity trip up the story he wants to tell, but he doesn’t ignore it either. He uses it as a stepping stone to get where he wants the characters to go. In this instance, the story revolves around baby mutants being born in Africa, so the narrative focus shifts to Storm (thank the Bright Lady). Ellis’ X-Men are all in character. If you like your Beast super-smart and analytical, you got him. Scott Summers is in charge, but also willing to consult with his team members when he needs more information. Wolverine is still the rebel, but willing to toe the line when it counts. Emma is her delightfully snarky and precocious self. Hisako (Armor) still doesn’t have a personality (aside from talking junk to Wolvie) and Storm seems to have the spotlight to explore the facets of her complicated selves (Goddess, Queen, punk rock rebel). I think Ellis is doing his best to reconcile the married Ororo with the free spirited former X-Men leader. In the above scene, Ellis reminds readers that Scott and Ororo used to be friends, something folks who constantly fight over who is the better leader seem to have forgotten. I like that Ororo feels she can joke with Scott, even so much as teasing him. This is the two most prominent X-leaders at their best. I would like to see this aspect of Cyclops and Storm’s relationship continued. “Ohmigod, she’s barefoot!” screams the internet. Well, I was surprised by her sudden lack of footwear, but it’s not like there isn’t any precedent for Storm to not wear shoes. In her first appearance she’s only wearing a loincloth. However, she’s come a long way since then. It’s one thing to be barefoot while hanging out on the roof of the X-Mansion with Gambit and another to not wear shoes while on a mission, but I’m okay with it either way. Recent X-books have been about a sequestered cast who can’t leave an artificial island off the coast of Marin while every resurrected enemy attacks them. There’s something really claustrophobic about those kinds of stories, and like Storm, I’m not into closed spaces. Here’s hoping that Ellis’ stories can expand the narrow scope of recent X-storylines and delve into what makes the X-Men great–their character.